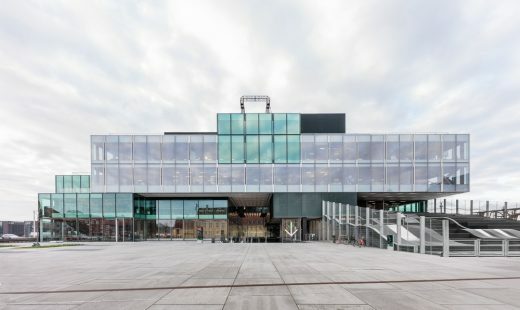 The BLOX project, home of the Danish Architecture Center (DAC), contains exhibition spaces, offices and co-working spaces, a café, a bookstore, a fitness centre, a restaurant, twenty-two apartments and an underground automated public carpark, but it is not the acrobatic mixing of uses that defines this project; its ultimate achievement is in ‘discovering’ its own site. 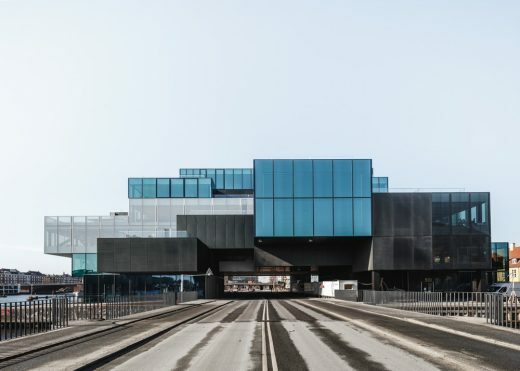 The Old Brewery site, split into two by one of Copenhagen’s main ring roads, didn’t really register as a building site until the design of the new DAC identified it as such. 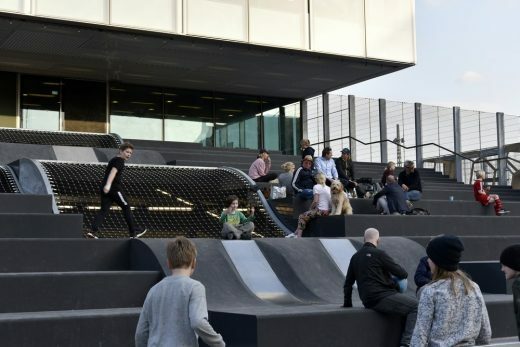 Straddling the road, making public connections both above and below, BLOX connects the parliament district with the harbour front and brings culture to the water’s edge. A space for cars becomes a space for people; a space to pass through becomes a space to reside. 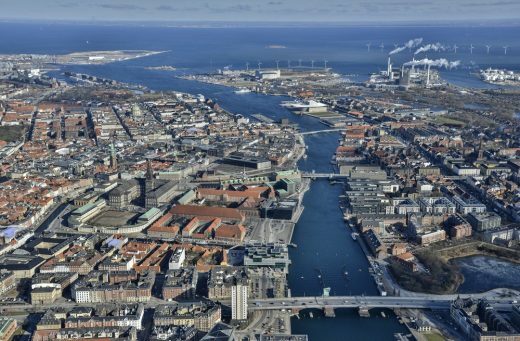 The Copenhagen inner harbour has a long industrial and military history. On reclaimed land, the building site initially housed a cluster of brewery buildings which burnt to the ground in the 1960s. 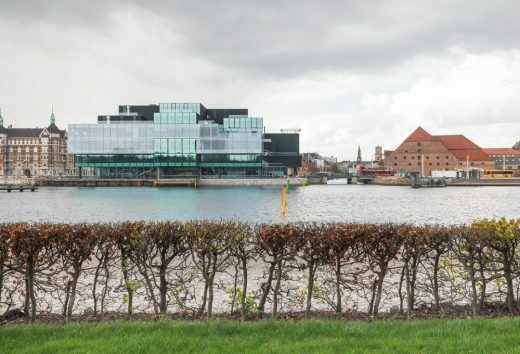 Since then the harbour has become the home of some of Denmark’s most notable architectural icons; a linear display of the tenets of Danish Modernism: monumentality, simplicity and politeness. BLOX adds a new impulse: creating an encounter between the water frontages, Kierkegaard’s Square and the city. 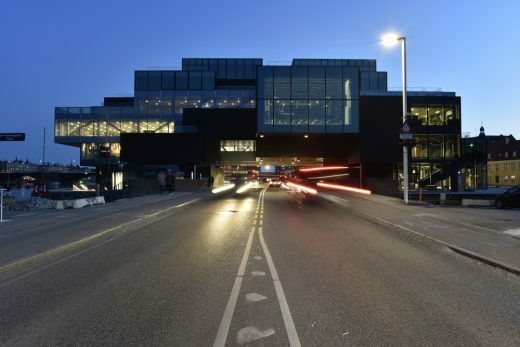 Its square volume, positioned directly along the harbourside, creates a sheltered public city square against the traditional yellow buildings and a much needed built front for the existing library square. 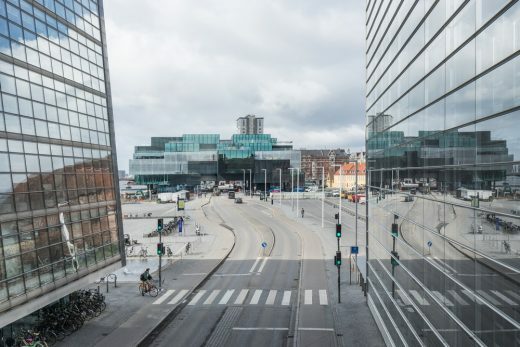 Contrary to most city blocks in Copenhagen – often introverted and inaccessible – the building absorbs the city’s life. 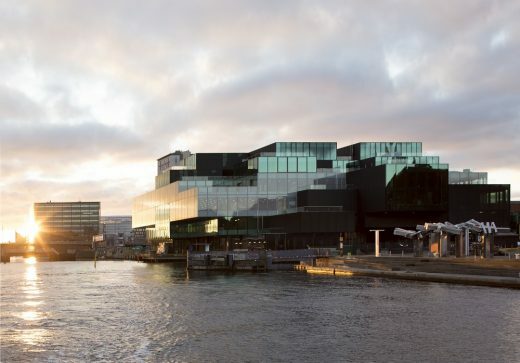 The urban routes through the building lead to unexpected and unpredictable interactions between the building and the city, linking the different museums, libraries and historical sites around the culturally rich Slotsholmen area. A linear park along the harbour flows down below water level along the quay wall and through the building. 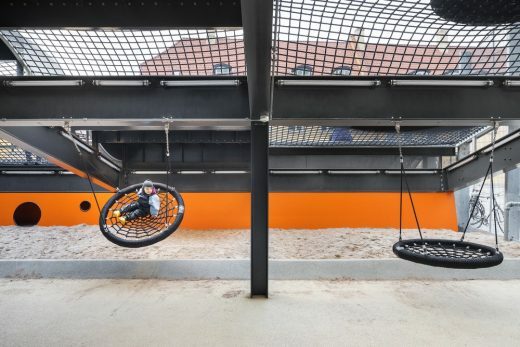 The former playground is incorporated into the new building, as a partially covered and terraced public space, which can be transformed in the evening into an open-air cinema acting as a public foyer. The building’s exterior is marked by a stacking of the same geometric forms in different arrangements. 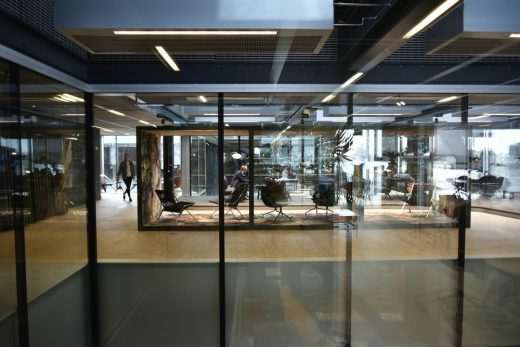 The offices are contained in a rectangular ring of glass facades shaded in a white frit. 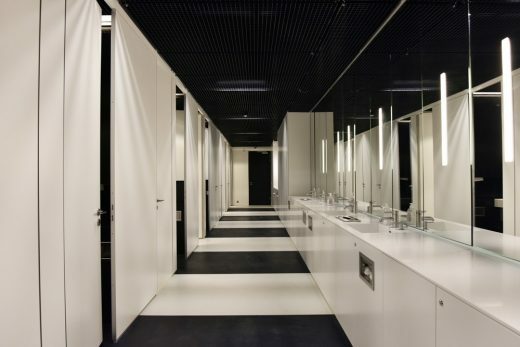 The ground floor functions are located in separate volumes generating openings which form the public entrances and bring the city in to the center of the building. The apartment volumes are fragmented and recessed for privacy, the landscaped terraces encircle the DAC’s central rooflight. 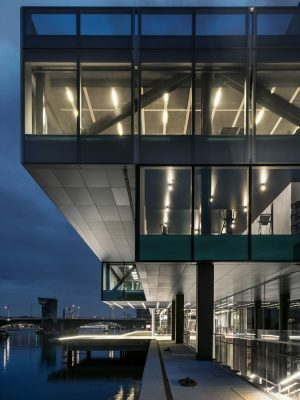 The building’s coloured textures subtly echo the sea tones of the harbour, ever-present in the reflected light of the water. The DAC itself forms the core of the BLOX Project, positioned in the centre, surrounded by and embedded within its objects of study: housing, offices and parking. 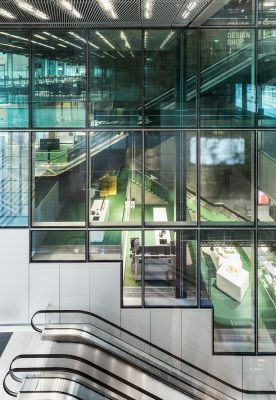 It is organized as a vertical sequence of spaces running through the building, starting below ground and moving upwards to the cafe with its view over all of Copenhagen. A broad sustainability vision has been developed for the project, not just in terms of the usual energy, carbon and resource issues, but addressing the wider social and economic impacts. The Arup SPeAR® assessment served as a tool to analyse the project and record progress against a comprehensive, holistic set of criteria spanning environmental, social and economic aspects within the wider cultural and geographical context. 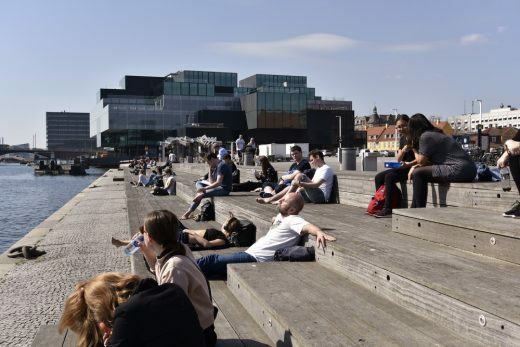 Denmark’s advanced low energy requirements for buildings, arising from the 2009 Copenhagen Accord, demand an operational energy usage much lower than other countries. 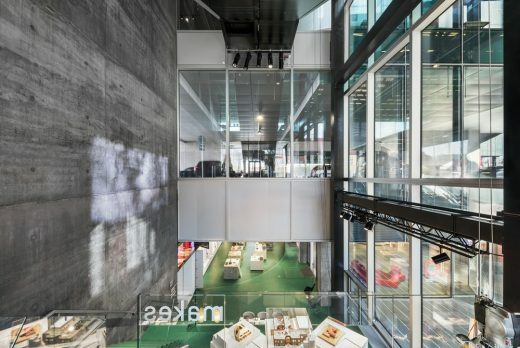 Bringing the building’s design in line with these criteria involved rethinking its mass and façade concepts, involving ways to reduce CO2 emissions and embodied carbon during construction and operations, as well as researching new solutions to offset and neutralise the carbon usage. 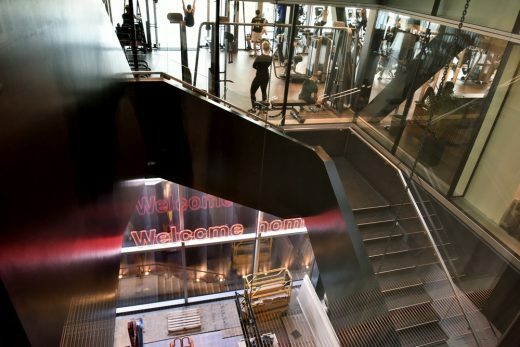 The building makes use of on-site renewable energy and achieves the Low Energy Class with a primary energy usage of under 40 kWh/m²/yr. User comfort and lifetime flexibility are important elements for the durability of BLOX. 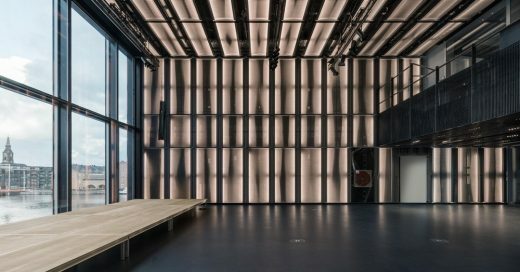 The building is acoustically isolated from road noise and vibrations with a highway bridge construction and high insulation facades. 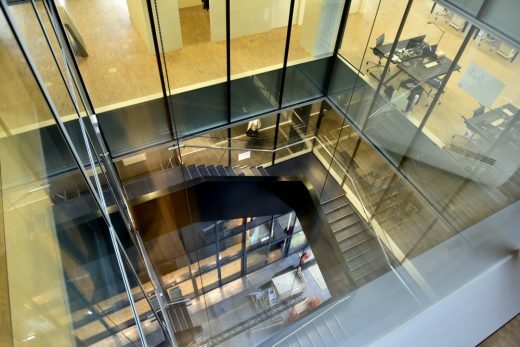 The office facades are fully glazed to provide a generous outlook and to reduce lighting energy usage. 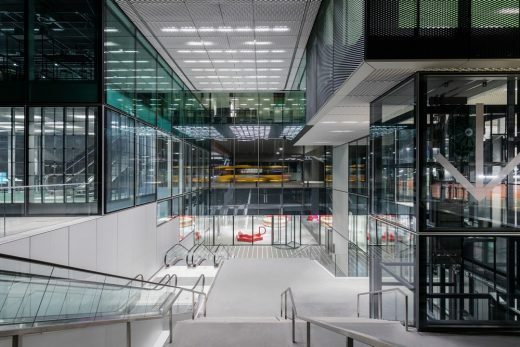 Minimal low-energy lighting fixtures combined with user task lights are used, and both lighting and facade sun shading are automated through centralised daylight control, with user controls. 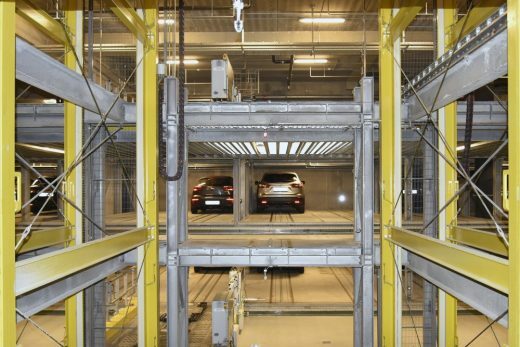 The building is served by a high specification heat recovery plant which uses Copenhagen’s district heating and cooling system based on seawater cooling and the use of residual heat from electricity generation. 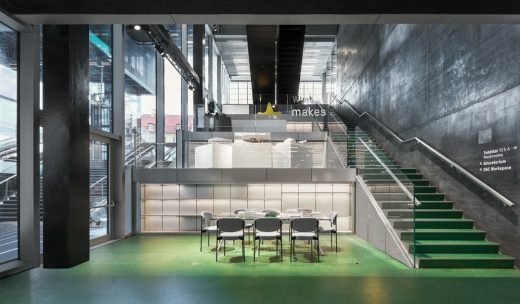 Program: Mixed Use building: DAC Danish Architecture Centre, Apartments, Offices, Restaurant, Retail, Automatic parking, Urban Park & Playground. Team: Federico D’Angelo, Fred Awty, Soren Thiesen, Will Hartzog, Dennis Rasmussen, with Nina Grex, Lea Olsson, Brigitta Lenz , Anna Grajper, Chong Ying Pai, Cristina Martin de Juan, Saskia Simon, Mateusz Kiercz.